At the beginning of each month, the submissions are supposed to follow a theme and for next week — Monochrome Madness No. 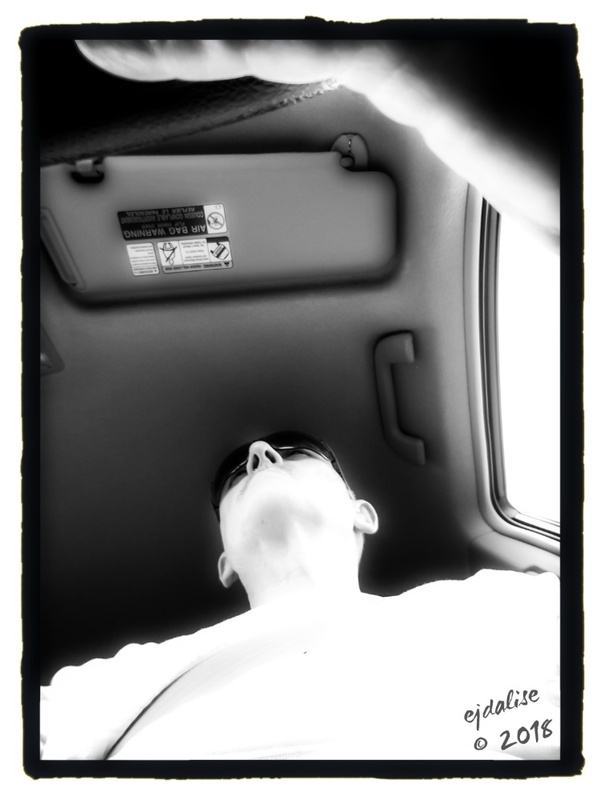 203 — the theme is From Under. Since I still haven’t set up my PC, I don’t have my usual 100K+ photos to draw from and I ended up having to choose something from the 1,600 photos on my phone. Not the most flattering of photos but since I don’t suffer from low self-esteem (I have low self-esteem but rather than suffer from it, I cherish it) I have no problem sharing it. Also, I was drawing again . 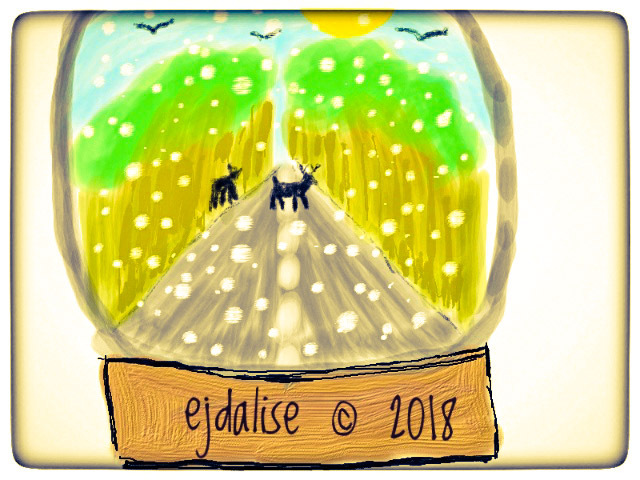 . . this is supposed to be a snow-globe scene of two deer crossing a road. I don’t think the drawing does a good job of conveying the idea of a snow globe, but since I don’t have the skills to create a realistic version, I’ll call this an interpretive rendition. The best I could do was punch up the colors a bit. It is, after all, a fairly simple sketch; there’s just not much that will breathe much life into it. The first is a new word (or new to me) that I came up as a standard answer when a pundit or host (often, one and the same) asks a leading question during what passes for news these days. The second GIF is my answer to emojis . . . a self-descriptive GIF file. Did you get it? I mean, it’s pretty crude because the tool to generate these is fairly limited. It’s a “face palm” . . . clever, no? The other way it could be interpreted is to have the piece represent a cup of tea which would make that a representation of Mr. T.
I’m falling asleep, so I’m sending this out as is. Hopefully, I’ve not made any majpr errors in the above text. Monochrome Madness is open to all. As mentioned, it is not a contest; it’s a showcase for people’s adventures in B&W photography. Professional or amateur, all are welcomed. If you have a favorite B&W photo or even a not-so-favorite, consider contributing; you will not be judged, and the photo might provide enjoyment for a pair of eyes or two. Monochrome Madness comes out on Wednesdays in Australia but because they are ahead of us in time zones (about 23 hours or so), it’s actually published here the day before. Or it should be. If you plan on submitting, please follow the procedures listed on the site. This entry was posted in Black & White, Photography Stuff and tagged Black and White Photographs, Black and White Photography, Leanne Cole, Monochrome Madness, Photography. Bookmark the permalink. Oh! Wow! This post is filled with fun fun FUN, Emilio! From your lap taking a photo/your From Under selfie…to your drawings…to your GIFs…all fun! 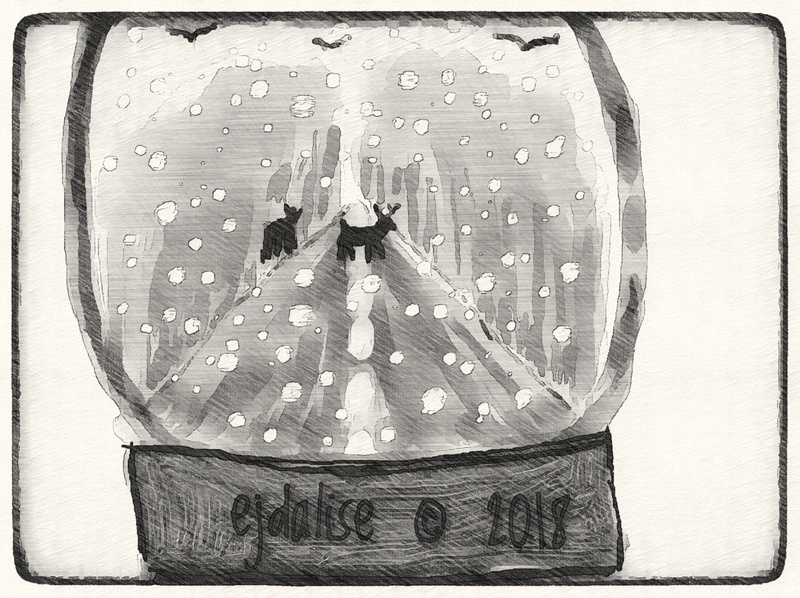 I find snow globes cool and they entertain me. I especially like the 2nd GIF! PS…looks like you keep your nose clean! Snow globes always worry me because I can envision them breaking and releasing the blizzard within. As four the gifs, they are supposed to be available for the texting program I use but mad by people use the kind of texting app that limits the size of the attachment and those usually exceed the limits. Still fun to create. And yes . . . Ambidextrous and constant picking do the job. I’m identified as a polymath in many similar fields. I’m self- taught and with expertise earned from many hours of practice. Polymath men like yourself should share your much learning by teaching classes in such fields. I fear my techniques are too radical and advanced for mere mortals to attempt. Also, the liability of unintended injuries is too great to risk to take. This is about average for most of my posts.